The Recovery Community provides a safe and welcoming environment where students in recovery can receive support while working to obtain a college degree. It applies best practice strategies that assist students in developing the behaviors and skills necessary to allow them to succeed academically, personally and professionally while in recovery. Recovery Community is the proud recipient of the 2014 MNSCU Innovative Student Affairs Program Award and the 2016 NASPA IV East Innovative Program Award. Our collegiate recovery community supports St. Cloud State University and St. Cloud Technical and Community College students who have struggled with substance abuse and addiction and now are now committed to sobriety. We are among the leading universities across the country that have established residential collegiate recovery communities. These programs have proven highly successful; their students have emerged as vibrant campus leaders, typically achieving higher average GPAs than their campus peers. We are not a treatment program or facility. We do not provide residential or outpatient treatment services. We do not work with government programming such as drug court, probation or parole. We are not a halfway house. We do not provide medication-assisted recovery. We provide support to students who have been in active recovery for a minimum of six months and have a strong desire to continue to live a sober life. The Recovery Community is located in the Coborn Plaza Apartments. This high-amenity facility provides a perfect environment for students committed to maintaining their sobriety while also pursuing a college degree and participating as members of a traditional college community. This spacious facility offers each student a furnished private bedroom and bath in a four-person apartment unit. Recovery Community members must pay tuition and room and dining fees. There are no additional costs. Members may apply for a $1,000 - Mary Beth Wedum Recovery Community Scholarship each semester. In addition to our living community, students are able to get involved with our student organization called Students Taking action in Recovery and Service. S.T.A.R.S. offers hope, self-advocacy, education, and guides students to make responsible choices that support their academic endeavors and their recovery and wellness plans. STARS is inclusive to all students. All students interested in recovery, wellness and success are encouraged to join. We meet once a week to discuss service opportunities and advocacy initiatives. In addition, we plan and host many social opportunities for members and the community at large. St Cloud is home to a variety of support group meetings including AA, NA. Al-Anon, CMA, All Recovery, SMART Recovery and Celebrate Recovery. The Alano Club, with 30 meetings per week, is located across the Mississippi River from campus. 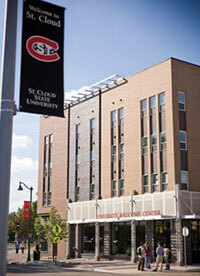 At St Cloud State, we have three support group meetings every week: AA,NA and All Recovery. Campus NA meetings are 7 p.m. Mondays in Mississippi Room, Christ Church Newman Center. Campus AA meetings are 6 p.m. Tuesdays in Delta Room, Christ Church Newman Center. See All Recovery meeting details. Students are admitted into the Recovery Community on a first-come, first-serve basis. Each applicant must complete, and abide by, a Recovery Community Agreement, pledging to maintain sobriety and foster community outcomes. The Recovery Community partners with UCHOOSE for education and support services. The work we do would not be possible without the generous support of the many individuals, families, foundations, and companies. To support the mission of our program, consider making a tax-deductible donation. Be sure to select "SCSU Recovery Community Fund" in the fund-designation tab.